I received an email from a friend at the Dutch Cyclists Union - Fietsersbond. In the subject line it read, "Airbags instead of bike helmets". 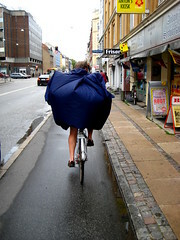 Back in June 2008 I blogged about Bicycle Airbags on Cars and about how the Danish Cyclists Federation were interested in getting the Traffic Safety Board to investigate a Dutch study that suggested external airbags on cars would save cyclists' lives. That was the last we heard of it in this country. But the Dutch... oh, the Dutch... Undefeated World Champions in Bicycle Advocacy and Societal Rationality... (no, let's not forget the Hungarians...) they've kept at it. The idea of airbags on cars to protect cyclists started as a kind of a "what if..." story in the Fietsersbond's magazine a few years ago. Now the idea is nearing fruition. In a press release from early March 2010 the Fietsersbond boldy declares that cars will be equipped with airbags for cyclist collisions by 2015. The Dutch do their homework. Like any self-respecting advocacy org they have traffic consultants dedicated to scientific issues and they know that bicycle helmets don't have a lot going for them as far as effectiveness goes. They know that the mere promotion of helmets reduces cycling and they've read the chilling results of the mathematician Professor Piet de Jong's study about the heavy price helmet laws inflict on countries and regions. So, in an inspired moment of rationality, they decided to put forth the idea of putting air bags on the machines that cause the damage - the cars. No ignoring the bull here. Place the responsibility where it belongs. The airbags for cars idea met a great deal of enthusiasm in the Netherlands. So much so that funding has been given to test the idea. The crash test in the film is one of a series to determine where cyclists land on cars in order to figure out where the airbags should be placed. The next step is the completion of a detection system for pedestrians and cyclists. Then there is a test on the streets of Amsterdam. "Thanks to this detection system, an airbag will be activated in the event of a collision so as to considerably cushion the impact of a cyclist’s head on the windscreen. The cyclist will not die from his injuries, and will have a good chance of coming out virtually unscathed." "The test in Amsterdam will take a year. The researchers of Autoliv and TNO Automotive want to know if the sensors on the front of the car will function well under all weather conditions. The test car will be fitted with a button which the driver must push in special situations, such as a collision or near collision. The recordings of the detection system’s cameras will be saved. The researchers want to analyse the observations of the system. A collision sensor is fitted in addition to the sensors - the cameras - that will recognise cyclists. This collision sensor registers when a cyclist is indeed hit and an airbag should be activated. These extensive tests are needed in order to make sure that the system is fully reliable. The airbags should only be activated when a cyclist or pedestrian is hit. It is not supposed to activate when the car hits a pigeon or post." ‘The airbag is expected to be taken into production in 2015, but that of course depends on the wishes of consumers and car manufacturers’, says Van de Broek of TNO. A compulsory airbag on the windscreen will add a couple of hundred Euros to a car’s price tag. But what does it yield? According to Zeegers, it may save dozens of cyclists’ lives in the Netherlands. In terms of the EU we are talking hundreds of lives." 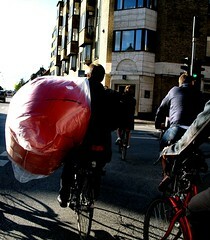 The airbag system is a big success for the Fietsersbond. ‘In collisions with passenger cars in which the cyclists dies, it is nearly always the head injuries that are fatal. That’s why we’ve been busy for years trying to find out how we can make cars safer for cyclists’, says Zeegers. TNO carried out an exploratory study on the instructions of the Fietsersbond four years ago. They expected the shape of the front of a car to largely determine the seriousness of the injuries. Ultimately however, it emerged that airbags on the exterior of a car may save many a cyclist’s life. But they have to be in the right position. clists however. Their heads usually do not hit the hood, but the upper part of the windscreen. If they are unlucky, their heads even hit the hard metal window stiles. This is where airbags for cyclists should be fitted. So we know that an airbag can drastically cushion the impact. But by how much? Researchers express the force of the impact in Head Injury Criterion (HIC). This HIC value should stay below 1,000. For the elderly, this value should even be below 600. During computer simulations carried out by TNO in 2008 it emerged that in a collision at 30 kilometres per hour, the cyclist endures an HIC value of 3,700. Hardly anyone would be expected to survive such an impact. With the airbag however, the HIC value dropped to 590. All a cyclist will suffer from in that case is a headache and dizziness. Here's a link, in Dutch, to the Fietsersbond's page about this exciting project.